The “500 Coupé Zagato” – the concept created by one of the most famous automotive design names in the World with the collaboration of the Fiat Group Automobiles’ Centro Stile – made its debut at the 2011 Geneva International Motor Show. 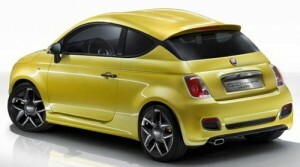 Presented at the Fiat stand, the prototype stands out for its sinuous yet decidedly sporty and contemporary contours. A look inspired by the namesake predecessor built in the 1950s by the famous Italian body-worker on the chassis of the 500. Yet while Zagato had then completely revamped the exterior style of the basic model, today the designers emphasized the silhouette of the Fiat 500, already similar to a coupé, but with even more aggressive appeal. In addition, the unique shape of the roof features the characteristic “double hump” (the true emblem of Zagato) teaming the lowering of the car with continued excellent interior comfort. Like many historic custom-built cars, the concept car affords the classic “2+2 seater” formula, retaining the compact dimensions of the basic model. So it is a compact car that “conceals” under the bonnet the revolutionary Twin Air 105 HP engine. This powerhouse maximizes the “fun to drive” of this car, while ensuring excellent performance levels against a considerable reduction in fuel consumption and emission levels. The 105 HP Twin Air engine, has never been used on any of the Group’s models, therefore it is the ideal engine to be installed in compact sized sporty cars. Demonstrated by the high torque delivered (155 Nm at 2,500 rpm) and the World record in terms of absolute power (105 HP at 5,500 rpm). In addition, at 124 HP/litre, this engine is also one of the world leaders in specific power. All while ensuring reduced fuel consumption and CO2 emissions unrivalled in this category: 95 g/km. Designed mainly for a young – and young at heart – dynamic male target, the “500 Coupé Zagato” also accommodates the needs of a female target. Accomplishing this owing to the painstaking pursuit of stylistic solutions resulting from the most interesting trends in colours and materials. For instance, the prototype livery is Pop Yellow, a specific three-layer body-paint colour tending towards white which emphasizes the vehicle contour while giving it a pop image: full of energy and brimming with personality. The same styling effect can be found in the interiors, specifically the seats. Inspired by the traditional sporty “diamond” seats and high-tech fabric teamed with yellow chamois leather and the black natural leather of the surrounds giving it a young, contemporary look. The sporty appearance is continued on the steering wheel – also covered in leather with contrasting stitching the same colour as the yellow chamois leather grips – and on the dashboard surround, matching the exterior colour, which was treated in burnished “eco-chrome” to give it a more aggressive appeal. Lastly, another typical feature of coupé vehicles is the lining of the roof panel with dark high-tech fabric embellished by a transparent single-filament yarn that gives it a delicate shine. To make cars distinguished by an original style, advanced technology made accessible to all and intelligent solutions that simplify and improve life on-board. An example? Just like the basic model, the “500 Coupé Zagato” also features “my-port”. The practical multimedia port installed on the dashboard allowing the driver to link up to the World via a latest generation smart phone enabled to access the Internet and satellite navigation.